Take the Britannica Curiosity Compass Quiz and discover your curiosity profile. Britannica launches Curiosity Day, in celebration of its 250th birthday, with a series of curiosity-sparking activities for classrooms, families, and lifelong learners. 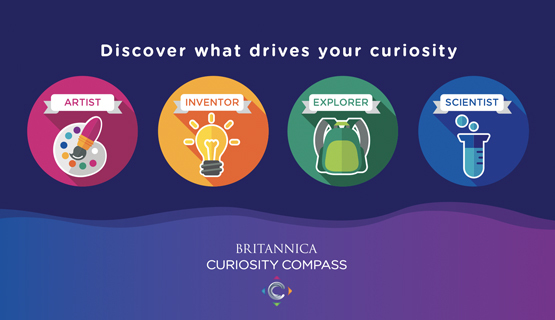 Families can take the Britannica Curiosity Compass Quiz and discover their curiosity profiles and how they each navigate discovery. • Then scaffold with question starters: Who, What, When, Where, Why? • Extra Credit: Research the background of the photo, either as a class or on one’s own. • Explain: Curiosity is a skill or a tool. Curiosity shows up in a lot of different places and a lot of different ways. There’s “school curiosity,” where your teachers give you some guidelines and help. Then there’s “real-world curiosity,” when it’s up to you to ask questions and find answers. • Pick one student to answer, then everyone asks “Why?”, and a second student provides an answer. Keep going until the class runs out of answers. • Extra Credit: Break into small groups and keep playing, either with pre-written question starters or have students come up with their own on the spot. High School Activity: What’s your curiosity personality? • How were you feeling about yourself before taking the quiz? Proud, self-conscious, shy, confident? • How about after? Do you agree with your results? • In your mind, which current or historical figures fall into the different curiosity categories? Why? • When is it important to be persistently curious about something? When is it not? Why? • How does it make you feel when your questions go unanswered? What do you do about it? Stay tuned for more curiosity-evoking activities, tools, and content from Britannica as we jump into our year-long celebration of 250 years of curiosity and joyful discovery. Share your Curiosity Compass profile results on social media, and see how your friends take on their curiosity.